When you rez Reality Threedee, take 1 bad publicity. When your turn begins, gain 1credit (or 2credit if the Runner is tagged). I'm currently running this card out of GRNDL: Power Unleashed, and I've got to say it's way more powerful than I thought it would be. What this does is punish runners who don't want to run. In an age of Nexus Kate, there's a lot of games starting with what amounts to solitaire for the first 10 turns. 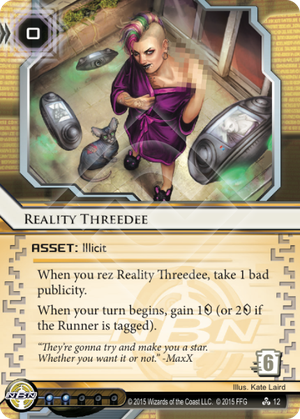 That's where cards like this shine, because the runner must average at least 1 run per turn to come out even against this card (and they must average 2 runs per turn to do the same if you're keeping them tagged). Most runners can't sustain that... especially if you're running a bunch of dangerous bad pub ice in your suite. Combine this with some solid taxing ice that can easily outscale bad pub (looking at you, Ireress and Swarm) and you've got yourself some actual economy. And, of course, you could always package this with Elizabeth Mills or similar to undo the bad pub if you don't want to go all-in on that strategy. The Broadcast Square. So the bad pub can be mitigated and a 0 to rez PAD that is harder to trash seems actually rather nice. The card has always been on the fringe of being useful, but dismissed with "...but how would you ever get bad pub in NBN?". As another addition Muckraker has been around for a long time helping you to land tags easily, paid by Threedee and the square. Also you might consider playing Grim in NBN, catching your opponent off guard. What I imagine is a deck that goes the Psycho-route of tag-storm for huge Beales and two-click Astros. So what's the downside? Sadly, there are actually multiple. For one this strategy lacks an appropriate NBN ID. The really efficient tag-storm decks like SYNC don't need the asset drip economy and have no room to spare for Grim or the Raker. Other identities sadly lack the power to make tags stick. Spamming the runner with Ravens and Gutenbergs works, but neither do those synergize the cards mentioned above nor do they provide you a benefit in the late game if the runner chooses to go tag-me. Another problem for the late-game-NBN is the weak ice and the small-agenda suite. There are no useful late game agendas in the NBN pool, so you will play more and smaller agendas, increasing the agenda density.